In these activities you will investigate the properties of prisms and pyramids. 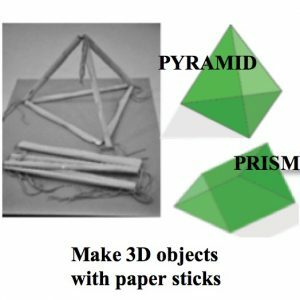 Full instructions are given as to how to roll scrap paper tightly around string to make paper sticks and tie the string together at the vertices to make ‘skeleton’ 3D polyhedra. There are activities for teachers to engage with together in a professional development workshop and activities for lessons.